← Prospect Review: How Did the Next-Generation Washington Capitals Do In Their First Preseason Game? It’s been a busy day for the Washington Capitals. A handful of veterans and a whole slew of eager Hershey Bears looking to earn their spot on the Washington roster shipped up to Boston today to play the Bruins in a preseason game. Ultimately, the Caps would fall to the Bruins by a score of 2-1 in a shoot out. Meanwhile, back at home, Alex Ovechkin paid a visit to FedEx Field to attend the Washington Redskins’ first home game of the season. Ovi, who has no concern over the certainty of his spot on the Capitals roster, hung back from the action in Beantown today, and along with his fellow teammates and countrymen, Evgeny Kuznetsov and Dmitri Orlov, made an inter-sport appearance similar to when Max Scherzer and Bryce Harper of the Washington Nationals attended the Stanley Cup Finals back in June. Upon taking to the field, the Great 8 was introduced and welcomed by thunderous applause from DC sports fans. He was named today’s “honorary captain”, as the Skins looked to come up big against the Indianapolis Colts in Game 2 of the NFL season. Aside from Ovi and some of his fellow Caps, the Redskins had another special guest in the house this afternoon: 16-year-old Sebastian who is a cancer survivor. 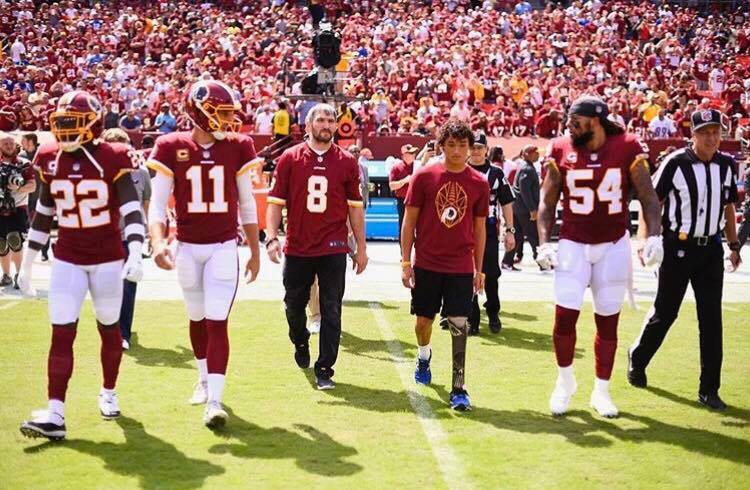 Thanks to the teamwork between the Washington Redskins organization and the Pediatric Cancer Research Foundation, the young man who beat Osteosarcoma was treated to the fan experience of a life time; and was named co-captain alongside Ovi. During his time on the field, Alex Ovechkin interacted with the young cancer survivor, as well as may other Redskins fans, the team itself, and of course, the media. Ovechkin, clad in a custom #8 Redskins jersey, alongside Redskins quarterback Alex Smith was present for the game’s coin toss, which gave the ball first to Skins. After the ceremonial coin toss, Alex returned to his box seats to rejoin Kuzy and Orlov, as well as his wife and the rest of their party. The Ovechkin’s newborn son, Sergei, was gifted a custom football jersey to match his dad’s and some matching baby booties by the Redskins organization. Unfortunately, today was not a good day for Washington sports. Following the Capitals preseason loss in Boston, the Redskins were bested by the Colts at home by a score of 9-21. The saving grace of the day is that the Washington Nationals beat the Atlanta Braves by a score of 6-4. Next Sunday the Redskins will look to beat the Green Bay Packers, while the Capitals have another preseason date the Bruins this Tuesday. This entry was posted in News and tagged Alex Smith, Alexander Ovechkin, Boston Bruins, Bryce Harper, Dmitry Orlov, Evgeny Kuznetsov, Hershey Bears, Max Scherzer, Providence Bruins, Washington Capitals, Washington Nationals, Washington Redskins. Bookmark the permalink. I had no idea Kuzy was at the Redskins game. But Orlov and his wife both documented the proceedings, as did Nastya.